Ataturk Dam is one of the world largest earth-and-rock fill dams, with embankment 604 feet(184m) high and 5971 feet (1820 m) long. Dam on the Euphrates River in southeastern Turkey, the centerpiece of the Southeastern Anatolia Project. 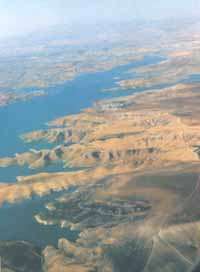 The Ataturk Dam is the largest in a series of 22 dams and 19 hydroelectric stations built on the Euphrates and Tigris rivers in the 1980s and '90s in order to provide irrigation water and hydroelectricity to arid southeastern Turkey. Completed in 1990, the Ataturk Dam is one of the world's largest earth-and-rock fill dams, with an embankment 604 feet (184 m) high and 5,971 feet (1,820 m) long. Water impounded by the dam is fed to power-generating units at Sanliurfa that have a capacity of 2,400 megawatts. From there the water is gravity-fed to vast irrigation networks in the Harran Plain and elsewhere in the vicinity. The Southeastern Anatolia Project (GAP) is a massive $32 billion public project to harness the power and potential of the upper reaches of the Tigris and Euphrates rivers and to irrigate the fertile plains that lie between them. When completed in 2010, 21 dams and 17 hydroelectric power plants will produce approximately 22% of Turkey's projected electricity requirements, equivalent to the entire national energy consumption in 1988. The Ataturk Dam, the sixth largest rock filled dam in the world, is the key structure for the development of the Lower Euphrates River region. Completed in 1993, it presently generates 8.9 billion kWh in electricity and is responsible for opening more than 180,000 acres of farmland to irrigation in the Harran plain. The new irrigation systems created by the GAP will double Turkey's irrigable farmland in a region which has traditionally suffered from light rainfall. New irrigation has already brought about a corresponding boom in agricultural activity. From just one crop per year, in many areas five crops in a two-year cycle have become or will soon be possible. Crop yields of cotton, wheat, barley, lentils and other grains have reportedly tripled in the Harran plain as a result of irrigation from the Ataturk Dam. Land values have risen rapidly. Family income, number of personal vehicles and number of tractors in the region have nearly tripled in the past eight years. The range of new products under cultivation is also expanding. Farmers are now experimenting with new varieties of fruits, vegetables, and nuts. 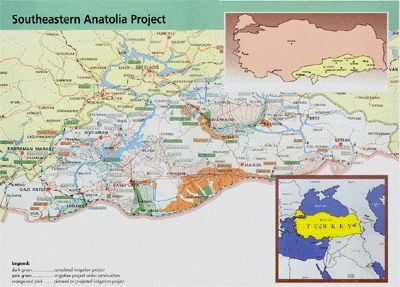 But the Southeastern Anatolia Project encompasses more than dams and tunnels. The purpose of the GAP is to eliminate disparities in the levels of development existing between this region and other regions of Turkey by raising income levels and living standards of the people who live in Southeastern Turkey. The GAP is a fully integrated development project designed to create economic and social opportunities with the full support of the Turkish government. While dams and irrigation tunnels are being constructed, the Government of Turkey promotes business development through industrial zones in each of the provincial capitals in the GAP region. It is training farmers in the most sustainable and economical land use practices; building airports and highways to ensure sufficient infrastructure for market development; and building schools and other institutions to raise the economic and social standards of the six million people who live in the region. The Government's stated goal is to increase the income level in the region five-fold and generate employment opportunities for 3.5 million people. Ataturk Dam Lake is the symbol of an important geographical change which opens up new horizons for the rich cultural heritage of the region. Extending over an area of 817 square kilometers, the dam is called "sea" by local people. The dam has already started to affect people's daily life. "Ataturk Dam Water Sports Festival" which has a history of four years is an important activity expected to enhance the culture of the region in the context of sports. The festival is organized jointly by the Turkish National Committee of Olympics, GAP Administration, General Directorate of State Hydraulic Works and the General Directorate of Youth and Sports. The objective of the festival is to promote tourism, publicize the versatile character of GAP, integrate socio-economic development with the advent of sports activities and to imbue the young people of the region with the spirit Olympics. 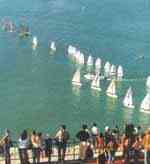 The first of this annual festival was held on 6-7 October 1995. Then came the second (4-5 October 1996), third (3-4 October 1997), fourth (9-10 October 1998) and the fifth (24-25 September 1999) festival. The last festival was participated by 396 athletes in the branches of sailing, rowing-canoeing, swimming and underwater sports. Among these athletes, there were 22 from Israel and Romania. Also 190 athletes were participated from Sanliurfa and Adiyaman. The festival will take place each year in October or September. How will GAP Change the Socio-Economic Structure of the Region?